Facts about English Foxhound Dogs, "Scientific name for English Foxhound Dog, or domestic canine, is Canis lupus familiaris". The English Foxhound Dog is a scent hound, athletic hunting dog that was bred so that it can help in hunting fox by scent. The English Foxhound Dog is a slower dog than their counter part the American Foxhound dog. It has straight-boned and muscular legs. It also has cat-like paws that are round in shape. English Foxhound Dog is a dog breed that has a skull that is wide and a muzzle that is long. English Foxhound Dogs nose is approximately 4 inches (10 cm) long, with wide open nostrils. Its hanging ears lie flat to the head and are set low. It has large eyes that are brown in color. 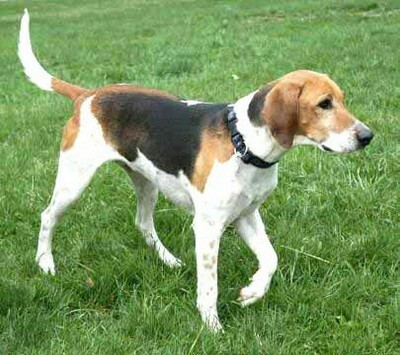 In addition, the English Foxhound Dog has a long tail that is set high and a coat that is hard, glossy, short and dense. The coat colors are white, black and tan. A English Foxhound Dog’s mouth can apply approximately 150 to 200 pounds of pressure per square inch and an American Pit Bull Terrier, German Shepherd Dog and a rottweiler can have 320 LBS of pressure on avg. All dogs are identical in makeup big or small– 42 permanent teeth and 321 bones. English Foxhound Puppies have 28 teeth and when they become adult English Foxhound Dogs they have 42 teeth. The average height of the English Foxhound Dog is 25 to 27 inches (63.5 to 68.6 cm) tall at the shoulder. The average weight is 55 to 75 pounds (25 to 34 kg). However, certain English Foxhound dogs can be considerably bigger with some weighing over 100 pounds (45 kg). The English Foxhound Dog is a passionate and courageous hunter. It is obedient and responds well to leadership but you have to be patient with it. Since it has high energy levels, it requires a lot of exercises on a daily basis. In the absence of enough exercises, these dogs can be destructive. English Foxhound Dogs have two times the amount of ear muscles than people. A English Foxhound Dogs can hear a sound at four times the distance of a human. Sound frequency is measured in Hertz (Hz) Def-Hertz is the measurement of frequency, explicitly it's one cycle per second. The higher the Hertz are, the higher the pitched the sound is. English Foxhound Dogs hear best at 45,000 Hz to 65,000 Hz, while humans hear best at around 20 Hz to 20,000 Hz. The English Foxhound Dog is friendly and enjoys human companionship. The English Foxhound Dog is tolerant, social and gentle, and gets along well with children but prefers the company of other dogs as well as other pets. English Foxhound Dogs really enjoys hunting foxes and can literally run the entire day without wearing out. English Foxhound Dogs sweat glands are between their paw pads. The English Foxhound Dog breed is generally health with very minimal health problems and complications. The only real health problems to be concerned about are, Renal Disease, Hip Dysplasia, Epilepsy. The lifespan of the English Foxhound ranges between 10 to 13 years. The English Foxhound Dogs are not recommended for an apartment life because they are very active and can get destructive when idle. An ideal situation for the English Foxhound Dog is country with lots of land to roam, a farm or a good sized fenced in back yard. Their glossy, hard and short coat is easy to care for. When purchasing a English Foxhound Dog from a breeder, make sure to find a good breeder with references, check at least two to three of the puppies that were purchased from this breeder. In 1903 the (AKC) American Kennel Club recognized English Foxhound Dog. A English Foxhound Dog is an omnivore, (definition-they eat both other animals and plants). All Dogs are direct descendants of wolves. The number one heath problems amongst English Foxhound Dogs is obesity, so always make sure your dog doesn't get to fat. Many foot problems that English Foxhound Dogs have are just an issue of long toenails. English Foxhound Dogs pant to keep cool with 10 to 35 breaths per minute with an average of 24 breaths per minute. A large dog breed resting heart beats between 60 to 100 times per minute, and a small dog breed’s heart beats on average between 100 to 140 pant a lot. Only humans and dogs have prostates, But a English Foxhound Dog doesn't have an appendix. English Foxhound Dog’s nose prints can be used to identify them, their nose prints are like a humans finger print. A English Foxhound Dog smells more than 1,000 times stronger than that of a human. A English Foxhound Dog’s nose, secretes a thin layer of mucous that helps it absorb scent, after that they lick their noses and sample the scent through their mouth.